Many offworlders know that the writings of Surak were preserved in the artifact known as the Kir’Shara. What many don’t realize, however, is that the Analects survived because they were copied into an ancient script designed for writing in clay. The script was developed thousands of years ago in the city-state of Dzhaleyl on the eastern shore of the Voroth Sea. Located on the mouth of the River Na’Ri, Dzhaleyl flourished as a busy seaport, controlling access to all other trading centers and settlements along the river. What remains of the Dzhaleyl script can be studied through the interpretive displays of shards, and in some cases wholly intact specimens, of accounting tablets, ship manifests, and storage containers in Dzhaleyl’s maritime museum and in the Hall of Antiquities at the Vulcan Science Academy. "Sochya" or "Peace," carved in the Dzhaleyl script on a kohl-lodzh'a. But these aren’t the only places the offworlder will see the Dzhaleyl script. Today, small samples can be seen in the windows and the shrines of many Vulcan homes. They’re called kohl-lodzh’a, a word meaning “meditation clay.” Quite simply, they are miniature tablets adorned with a single word or sentiment carved in the Dzhaleyl script. 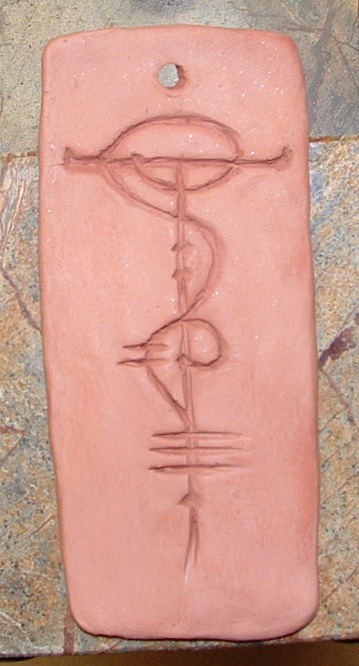 Following the discovery of the Kir’Shara, teachers brought the Dzhaleyl script into the classroom with this simple craft project using the red clay, which is similar to the terra cotta of Earth, found in the Na’Ri Valley. Students use replicas of ancient tools and are taught basic carving techniques along with the history of Dzhaleyl and the Kir’Shara. The example here was created by a student in Kir and deemed “acceptable” – worthy praise – by her teacher. Lately, the creation of kohl-lodzh’a has become a tradition for marking the start of the new year. Meditating on the future one hopes to create, one carefully selects a word or phrase that reflects that ideal and inscribes it into clay. Some choose philosophical constructs, such as a’Tha, a’riv’ne, kaiidth, ni’var, or kahr’y’tan, but the most popular sentiment seems to be sochya – “peace.” The craft continues the meditation exercise, ideally completed on the eve of the new year. Na’Ri clay dries quickly, without the need for firing, and is worked and reworked with wet fingers until the desired result is achieved. The next day, the clay is ready for hanging and scented with oils, if desired – a quiet reflection, resolution, or reminder for the year to come. Here is another example of a kohl-lodzh’a that a reader has kindly shared with me. May it also inspire peace and creativity through the new year. 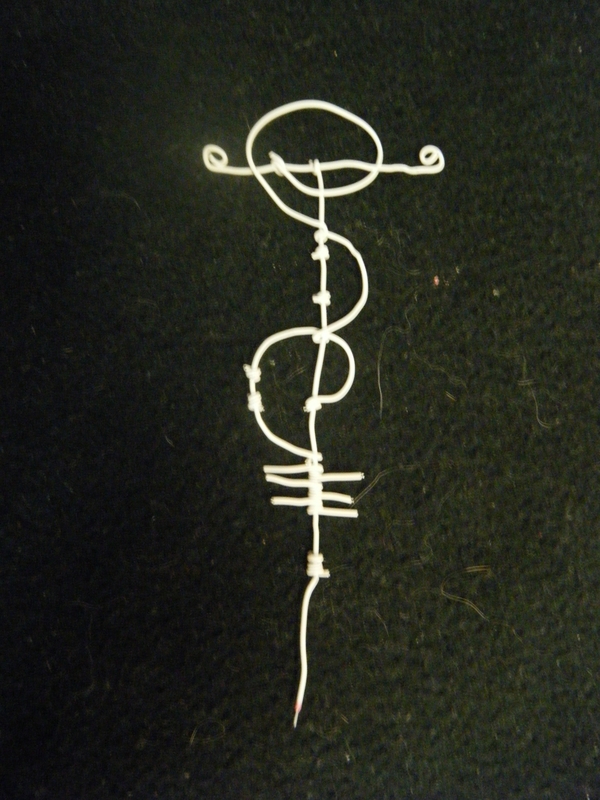 A kohl-lodzh'a created from wire by Zelfh'am T'ama. This entry was posted in Archaeology, Art, Language, Traditions and tagged Dzhaleyl script, kohl-lodzh'a, meditation clay, Star Trek, Vulcan New Year. Bookmark the permalink. Ni vaksurik — svi’venk heh svi’tanaf-renkup’es isha. Wi wa’bek-tor nash-veh weht-shefik pa’Dzhaleyl-kitaun. Sanu – ak’saven’voh. I’ugau nash-veh ta dungi shetau vaikausu dan-nayik. Itaren nash-veh odu na’tuhskaya eh krol. Pudor-tor nash-veh. Dungi nam-tor weht-shefik pa’Dzaleyl-kitaun nash-kastik-wak. Tanaf svi’torvaya. Aitlu nash-veh fereik-tor lef hi fam-tor nash-veh renkup’es. Sos’eh ein-gad. Kuv nam-tor tikap ik kup gol-tor nash-veh na’vuhrgwaya t’oDzhaleyl k’kanok-veh — sanu — ri vohta’voh ya’akash n’terzup. Itaren na’nufai gol-tor. Bolau nash-veh tikap da-tor tanaf svi’lef. Ri ma n’tumak. Dungi vuhrgwau tanaf. Sanu — vuhrgwa’voh tanaf vah sanoi. Ma nash-veh wehk-tumak-ves heh sanoi ta provulau dvolau fupa s’bolaya t’du. Wak ik satau tu — sanu — starpa’sha’voh shefik pa’ta aitlu tu ta fitor nash-veh. Hau-vel — Nam-tor zhit ik i’is-tor du ik °lef’° akan-zhit svi’Gol-Vuhlkansu. Fai-tor heh is-tor nash-veh nash-zhit vah °hiktra°. Nam-tor ven-tvah t’zhit-gen-gir ik °lef° bai’Gol-Vuhlkansu tviyan svi’zhit ik °lef’es° ik °texture° bai’FSE. Kup ken-tor nash-veh nash-is t’°lef’° na’tvah ik °font° bai’FSE, hi dungi fator is-tor nash-veh zhit ik °hiktra°. Sanu — ken’voh ta ri wedzh-tor nash’veh fan-tehn-naat fna’nash-skurin. Nam-tor ri thrap wilat punem-tor rim. Ken-tor. Dungi is-tor nash-veh zhit “hiktra”. Dungi paitaren nash-veh gol’nev t’du k’tum-vel-tanaf fereik-tor hiktra na’Dzhaleyl-kitaun. Dungi vuhrgwau ak.